The Professional Regulation Commission (PRC) and the Board for Librarians released results of April 2014 Librarian board exam in 3 working days after the exam. The full list of passers, topnotchers (top 10), top performing schools and performance of schools are available on this page as officially released online. 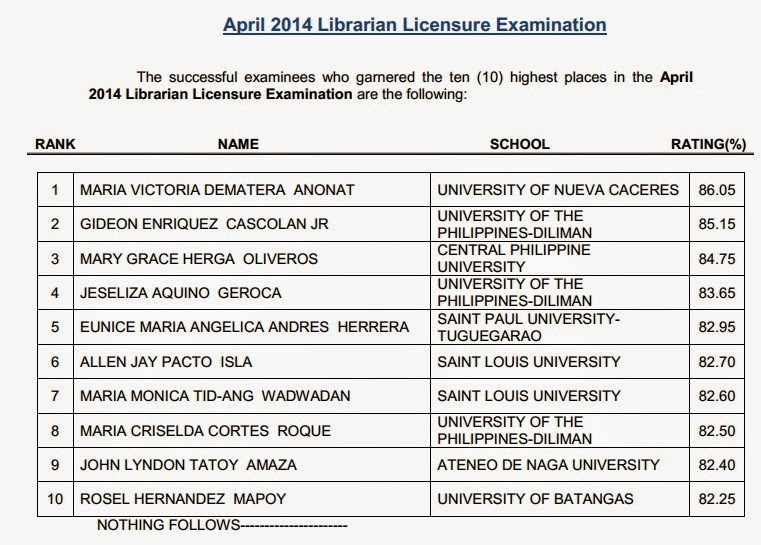 PRC announces that 149 out of 533 passed the Librarian Licensure Examination. Librarian board exam was administered by the Board for Librarians headed by Corazon M. Nera, Chairman; Arabella M. Ananoria and Mila M. Ramos, Members. April 2014 Librarian licensure exam covers the following subjects: organization, management and maintenance of multi-media based library or information service laws, trends and practices affecting the profession, reference, bibliography and information services and selection and acquisition of multi-media source of information (Day 1) and cataloguing and classification, indexing and abstracting and information technology (Day 2). In November 2013 board exam, results were released in two (2) working days after the last day of examination. A total of 382 out of 834 passed the exam. University of the Philippines (UP)-Diliman and University of Santo Tomas(UST) were named as the top performing schools by PRC. 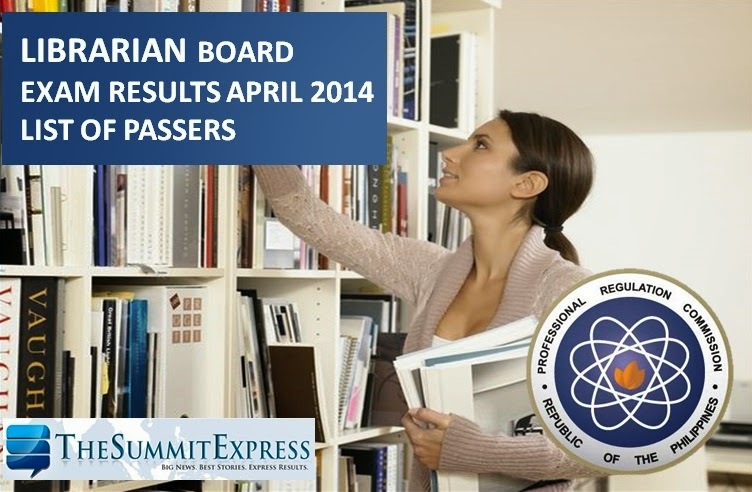 TheSummitexpress will update this page for the full results of April 2014 Librarian board exam. Like Us on Facebook and Follow Us on Twitter to receive updates. You may also subscribe to our RSS Feeds.